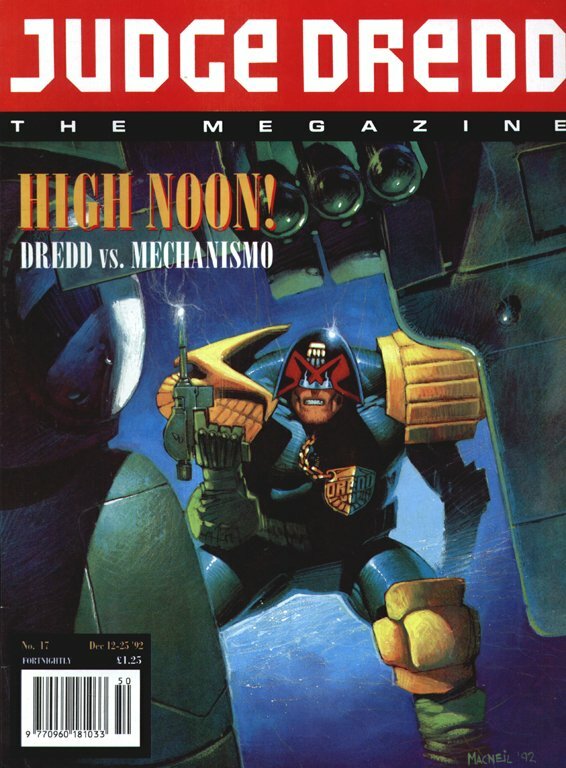 Mechanismo is the Judge Dredd epic where nothing happens. That's an exaggeration, but not much of one. Consider that its 18 episodes add up to 164 pages--exactly as long as "The Cursed Earth," a touch longer than "The Judge Child" or "The Apocalypse War" or "Necropolis." And what's the plot? 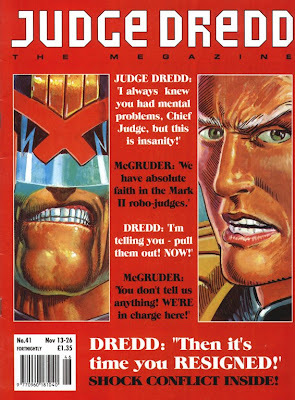 A big Judge robot goes berserk and takes Dredd-style extreme justice Too Far; Dredd tracks it down, fights it, and appears to put it out of commission. Repeat, with a different artist. Repeat, with a third artist, with the variation that Dredd and McGruder are now seriously at odds, and Dredd fudges the outcome of the fight in a way that isn't strictly by the book--setting up the "Conspiracy of Silence"/"Wilderlands" sequence that John Wagner didn't get around to for many months afterward. (Even the "small boy aims fake gun at robot" routine appears at the beginning of each of the three acts, with minimal variation.) 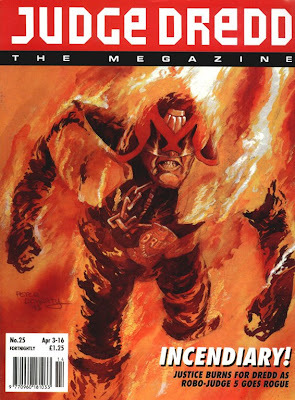 It doesn't introduce any major new characters; it doesn't really change the landscape of the series, aside from establishing that McGruder's gotten really unstable and nobody but Dredd seems to mind. It's the sort of story that the Wagner of a few years earlier might have dispatched in three or four weekly episodes. What we've got here, then, is decompressed storytelling before there was a name for such a thing in common circulation: not a lot of plot, but a lot of big, juicy images, and dialogue-free panels on many more pages than usual. It's a very different sort of pacing from any earlier extended Dredd sequence, and at the beginning of "Mechanismo Returns," Wagner points that out: "Returns" actually happens the same day as "Mechanismo." ("Body Count" happens in a similarly condensed time frame, but is set a year later.) It was a storytelling experiment, and not much like other stories Wagner was writing in that period--"Slick Dickens - Dressed to Kill" or "Bury My Knee at Wounded Heart," for instance. Really, one of the things I like a lot about Wagner as a writer is that he changes his M.O. every few years: this and "The Day the Law Died" and "The Graveyard Shift" and "The Chief Judge's Man" and "Day of Chaos" all have distinctly different voices, but a common sensibility underlying them. 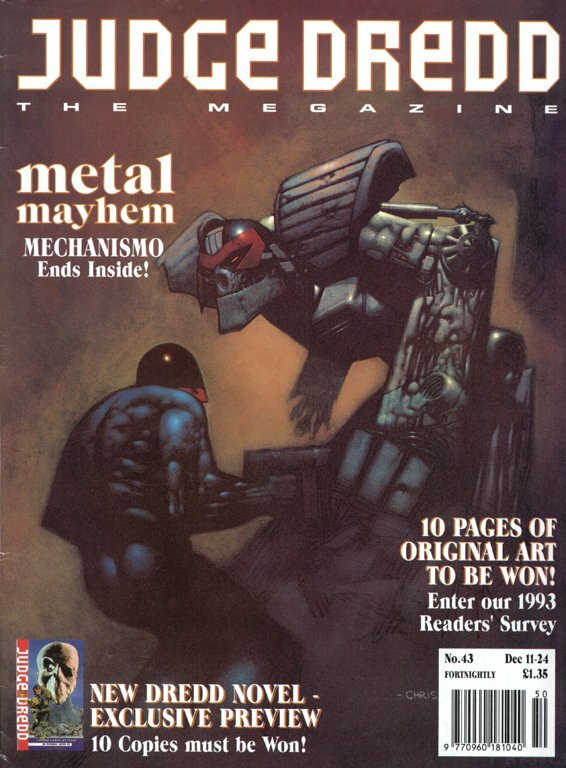 The concept behind "Mechanismo" isn't like any we've seen in a long-form Dredd story before. As I've mentioned, the fruitful longer Dredd storylines tend to be about the relationship between the man-as-law and the city. This one isn't. The idea is that Dredd dispenses judgement (for some value of "judgement," including his decision to bend the truth at the end), and the robot dispenses law without judgement. That's a decent contrast, undermined by the way Wagner completely fudges the "law without judgement" thing: the robot's just shooting everything he can find the most tenuous excuse to shoot. There's no uncomfortable ethical dynamic, as the story suggests at first there might be: is trial by machine a good thing? No! Done and done. The conclusion of "Body Count" is also rigged enough that Dredd has to explain it through expository thought balloons--an unusually awkward move for Wagner. Having the three sections of the storyline drawn by three different artists might've been an effective technique if they'd each had a different tone. 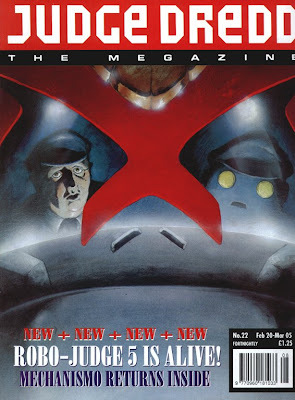 I recently got to read "Dead Ringer," from Megazine #3.64-69 (which doesn't look like it's going to get reprinted any time soon): a seven-part serial, written by Wagner and drawn by seven different artists, with each episode a distinct unit in tone and setting. By a few episodes in, Wagner has realized that its structure is so much like "The Judge Child"'s that he explicitly calls back to that story, even bringing back its alien cavemen; shifting the look and feel of every part makes it more fun. 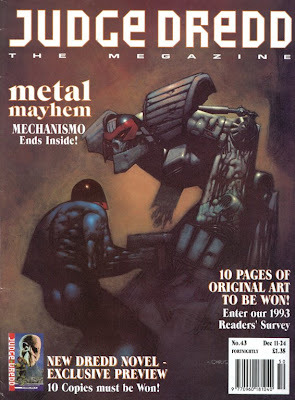 "Mechanismo" might've been the final time one of Wagner's stories was paired with Colin MacNeil's lush fully-painted color style before MacNeil switched to the pen-and-ink technique of "Fading of the Light" and beyond--although he's revived a black-and-white variation on it for Insurrection. In any case, he and Wagner are always a welcome team, and his yellow-orangey lighting effects (for a story that takes place over the course of an hour or two on a sunny morning) hold it together, and make it seem a bit more exciting than it is on reflection. Peter Doherty isn't quite as successful with "Mechanismo Returns," although it looks like he's trying to give it some visual continuity with MacNeil's work, shifting the color palette for the nighttime-set outdoor scenes but keeping those yellows and oranges dominating the indoor sequences. But whatever else they do, MacNeil's painted figures and settings always look really solid--an appropriate look for a story about a pair of immovable objects colliding. 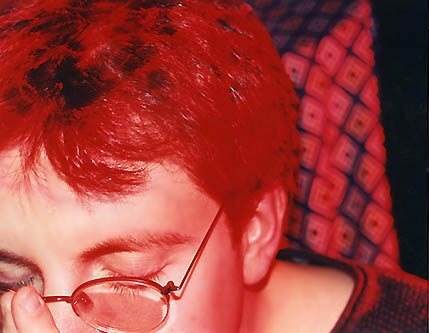 Doherty's figures, especially at this point in his career, had a touch of wobbly, blown-glass fragility about them. That's perfect for a story like "Bury My Knee at Wounded Heart," or even (in its way) "Young Death," but it lowers the stakes of a brute-force piece like "Mechanismo Returns." And Manuel Benet's artwork for "Body Count" is just kind of anomalous, in several ways: it's the only story he ever drew for the Megazine or 2000 AD, and it's rendered in a texture-heavy painted style that I associate more with early-'70s European fantasy comics than with the usual look of "Dredd." (That text-heavy cover above is also something of an anomaly.) His McGruder seems particularly off--Benet draws her as a handsome, silver-haired young man who happens to have earrings. I can see how he got there, but Carlos Ezquerra is nearly the only artist who's ever really nailed the look of a post-"Necropolis" McGruder who would be a convincing Chief Judge: a deranged old bat who nonetheless radiates commanding authority. 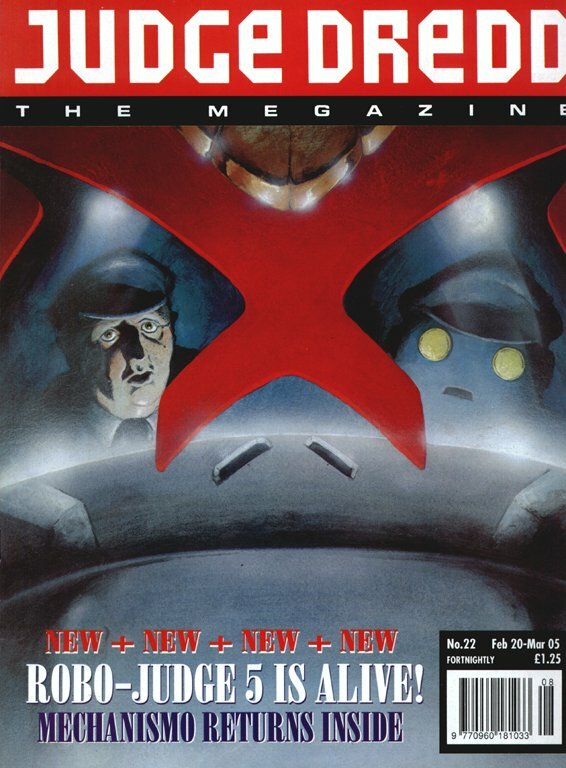 As a bibliographic note, Megazine #2.37--in which "Mechanismo - Body Count" began--was the first real "relaunch" issue the second volume of the Megazine had had, with all of the its features starting fresh. 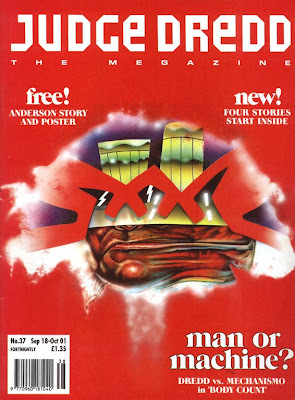 It's the one in which the Anderson story "Voyage of the Seeker" appeared, and that story's artist Mark Wilkinson also drew the trippy Dredd-mutating-into-Robo-Judge cover. The other features were a still-unreprinted Judge Hershey serial, and the first episodes of both "Return of the Taxidermist" and Shimura. That brings me to next week, when Anne Ishii will be joining me to discuss the collection of the early Shimura stories by Robbie Morrison, Frank Quitely et al.